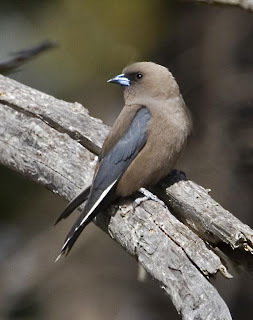 The accompanying photographs of Dusky Woodswallows were taken at Mortimer Bay. It's not a venue that I have regularly visited in the past, but seeking an area close to home and easy walking, Mortimer Bay near Sandford, fitted the bill. It has proved to be a surprisingly good site, with a good range of species, and many of them breeding here. Recent sightings have included 2 pairs of breeding Satin Flycatchers (not a typical site), a Horsfield Bronze Cuckoo being fed by Superb Blue Wrens, and numerous Blue-winged Parrots. 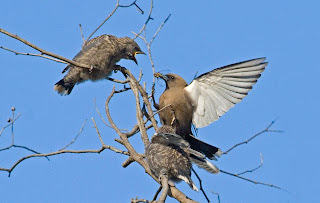 Other regulars have been Dusky, Scarlet and Flame Robins, Eastern and Green Rosellas, Common Bronzewing Pigeons (breeding), several pairs of Black-faced Cuckoo Shrikes, Black-headed, Yellow-throated, and New Holland Honeyeaters, and numerous Shining Bronze Cuckoos. I hope to publish some of the many shots taken here over the last few months, soon.